For Keshia Thomas, becoming the focal point of one of the most emotionally powerful photographs in American history was born out of compassion. 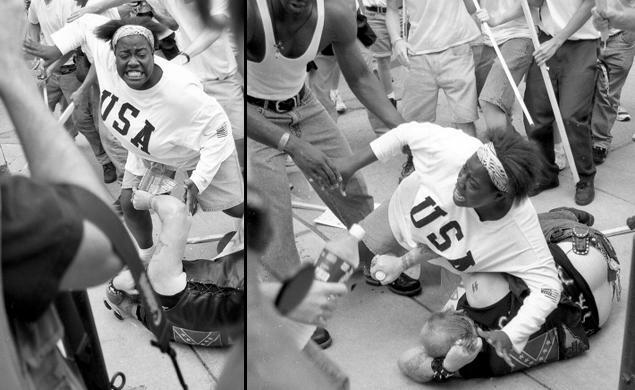 In 1996, when Keshia was only 18, a Klu Klux Klan rally was held in Thomas’s hometown of Ann Arbor, Michigan. Thomas, who had always been socially and politically active, attended a counter rally, where enthusiasm escalated into violence. “A woman with a bullhorn said, ‘there’s a Klansman in the crowd, get him,’” Thomas recounts. Thomas followed the crowd over to a man wearing confederate flag t-shirt and sporting a visible SS tattoo. Thomas’s aim was simply to shoo the man away from their demonstration. She remembered hearing a protest sign crack, a moment that spurred her to act quickly. As the crowd began to reign kicks and jabs at the man, Thomas covered his body with hers. Mark Brunner, a photography student and witness of the event, captured the act of kindness on film. The photograph went on to become Time Life’s Iconic Picture of the Year. Pulitzer Prize winning columnist Leonard Pitts Jr. wrote in his column praising Thomas’s bravery. Thomas kept this new found fame in perspective. Thomas’s photo didn’t leave the public conscience, especially among activists. Tom Callos of Auburn, a martial arts teacher and activist was especially touched by Thomas’s photo, which inspired him to try and track her down. “I stalked Keshia for a decade,” Callos said. “I finally found her on Facebook and said, ‘I’ve been searching for you for years.’” Callos, who packs his martial arts lessons with crucial messages about discipline and courage, saw Thomas as role model for young people. Thomas is using her clout as a modern civil rights icon to help bring attention to modern pertaining to social justice. Thomas recently completed a 1000 mile walk from Selma to Washington D.C. with the NAACP to promote causes such as economic justice, public education and voting rights. One of her fellow marchers was a 68-year-old man Middle Passage, who took his name after the deadliest stage in the Triangular Trade for slaves. Passage passed away before finishing the march. “He was the spirit for the march. When you see photos of him marching, he was in front, carrying an American flag,” Thomas said. “Seeing him leave earth reminded me: we’re not getting out of here alive.” Along their way, Thomas and her fellow marchers practiced what they preached, stopping to feed the homeless, offer rides to the weak and weary and on one occasion help lay a dead cat to rest. “We were marching for justice, we weren’t about to just march past this cat,” Thomas said. Her tenacity and commitment to solving issues landed her meet and greets with political behemoths like Rev. Al Sharpton, Secretary of State Hilary Clinton, Senator Bernie Sanders and even Oprah. Her appeal has reached across party aisles, namely when Gov. Mike Huckabee named her one of “Huck’s Heroes” in 2013. “[Huckabee] and I don’t have a lot in common,” Thomas said. “But we agree on those issues that cross ideology, on a human level. Currently, Thomas tours the US when she can, offering speeches about modern problems facing the nation. She’s currently laying the groundwork to start a non-profit in Detroit called Purpose Opportunity Independence and New Thinking (POINT), which will aim to develop opportunities for victims of economic injustice. “If I can help people find their purpose in life, it will affect their families, their communities,” Thomas said. “They can get back to dreaming, after living in dire situations when they might have forgotten what dreaming was.” For a growing number of socially plugged in teenagers and aspiring activists, Thomas recommends they simply start.